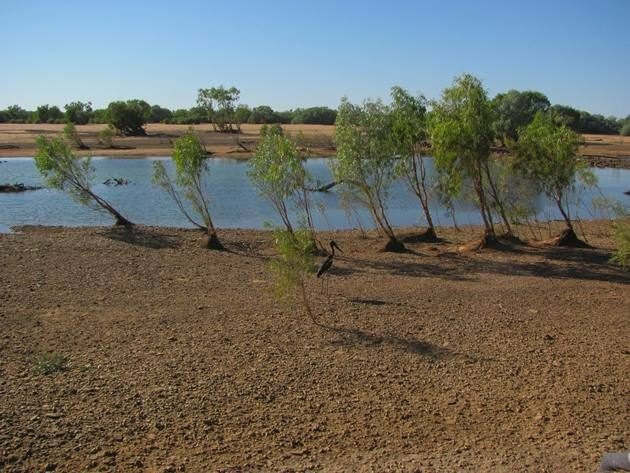 Last weekend we were camping in the bush at Langi Crossing on the banks of the Fitzroy River not far from Broome. There are always plenty of birds to observe and last weekend was no different. There is ample shade for a quiet weekend watching the birds and crocodiles and we have visited Langi Crossing several times over recent years to have a break from the coast. On previous visits we have encountered adult Black-necked Storks, but on this occasion there was only a juvenile Black-necked Stork. This young bird was quite curious and not at all concerned about the presence of humans in the area. 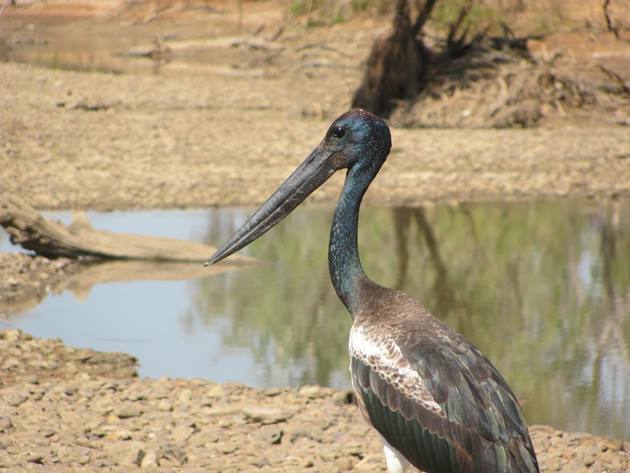 The juvenile Black-necked Stork was already the same height as an adult bird, which is approximately 130cm/51 inches. The wingspan of a Black-necked Stork is over 200cm/79 inches, but this young bird was quite content to just wander along the riverbank and we did not see it flying. 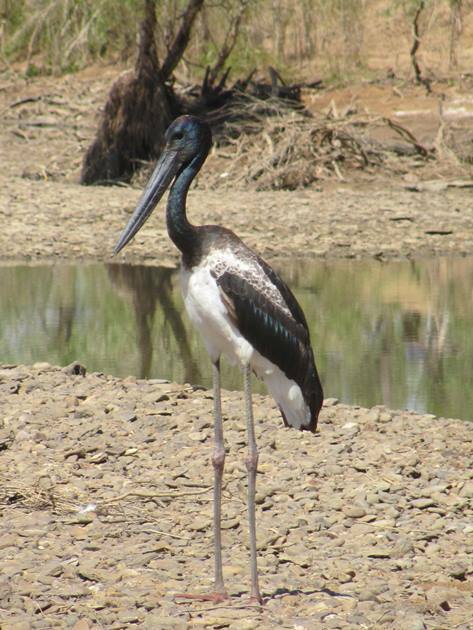 The Black-necked Stork wandered along the river bank and even into our camping area while we were there. I was able to get some very close up photographs of this beautiful bird and it actually followed us at one point as we walked along the river’s edge. The colours of the feathers were iridescent in the sunlight and the size of the bill of a Black-necked Stork is impressive! 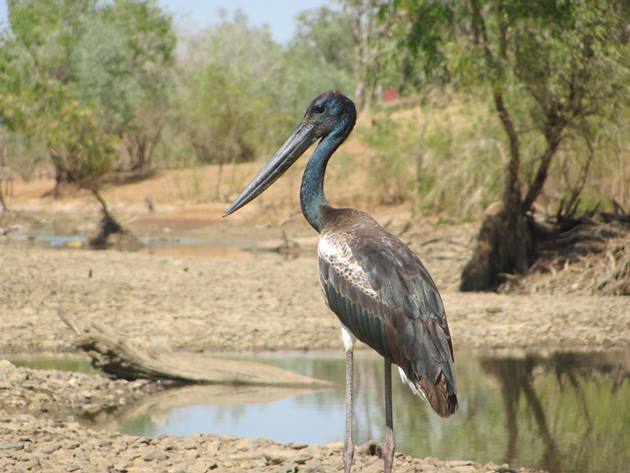 There are ample fish in the Fitzroy River for the Black-necked Storks and it is an ideal location for a young bird. 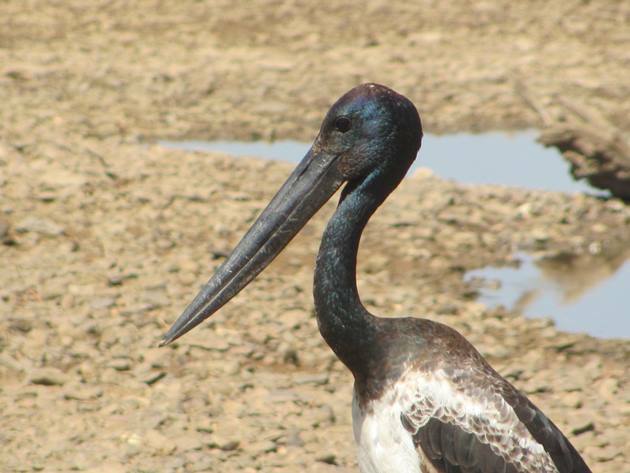 Black-necked Storks appear to have bred well this past year and we encountered forty at an ephemeral lake earlier in the year. The mostly juvenile Black-necked Storks had dispersed from that area on our last visit and are found on the coast as well as beside rivers and lakes. 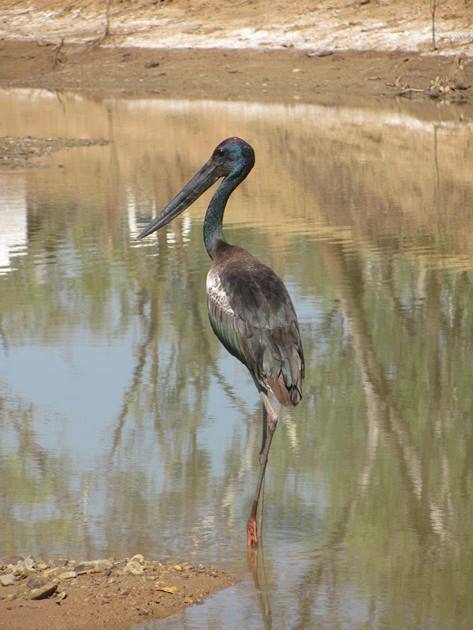 We have had a Black-necked Stork fly over our home this year too, which is not something we see too often! Over time the legs of the Black-necked Stork will change colour to a bright red and the plumage will become distinctly black and white. Female birds have yellow eyes rather than the black colouring of males and it will be several years before any breeding takes place. Thankfully this juvenile Black-necked Stork is well away from the highway unlike the poor confused juvenile bird that we encountered two years ago.